The main appeal of this card is the Action to get spells and rituals back, so I can focus my recursion elsewhere. Plus, with four 1 cost Lodge characters if I focus solely on recursion, it isn't a conflict between using the character and the tome. I am building a lodge/miskatonic "Tome" deck that focuses on shuffling success tokens about- this is a great Tome because its dirt cheap and very easy to trigger an effect for, so comboing well with the Library cards for example. For example, you can throw your own spells and rituals into the graveyard with the Lodge Librarian and just pick them back up with this thing. I've been looking at this again, and combining with The Great Library of Celaeno means you will never have spells and rituals in your discard pile. 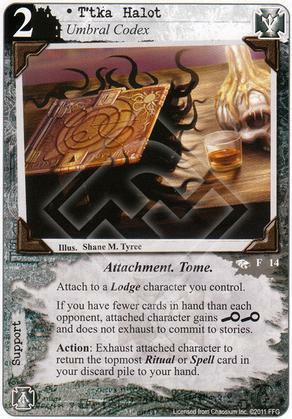 I hate how this card can only be attached to a Lodge character. So, you're telling me a Magical Theorist, the guy who seems like the most logical carrier of this book, can't use it? Makes zero sense.